- The following is a little back story, scroll down to skip to the trip report. - Just like with the White Mountain Hut to Hut Traverse, the idea of attempting this wild one day journey was planted in my mind by my dad when I was a teenager. About twenty years ago while spending the night at Phantom Ranch, (located at the floor of the Grand Canyon) my dad told me about hikers who start at midnight from the south rim, hike over to the north rim, then turn around and head back to the south rim with the goal of finishing the feat within twenty-four hours. - I thought the idea was cool and always remembered it but I never gave much thought about ever doing it. In fact, by my late teens hiking had basically fallen off my radar, and in my early twenties it was non-existent. My memories of the mountains had all but disappeared, there were only four places that could still jar my memory and peak my interest. Luckily, three of the four where in my backyard, (sort of) and within a days drive. Those three where; Franconia Ridge (Mount Lafayette, Lincoln, & Little Haystack), Huntington Ravine (Mount Washington), and the Knife Edge (Mount Katahdin). In 2006, my college friend Brandon Blindt, who was living in New Hampshire at the time, invited me to do the Knife's Edge in the summer, then a classic Franconia Ridge loop in the fall, followed by a 2007 Fourth of July hike up Huntington Ravine. Blindt ended up moving to North Carolina but the wheels were set in motion and I craved more. - In 2008 I did my first one day Presidential Range Traverse (Madison through Webster). 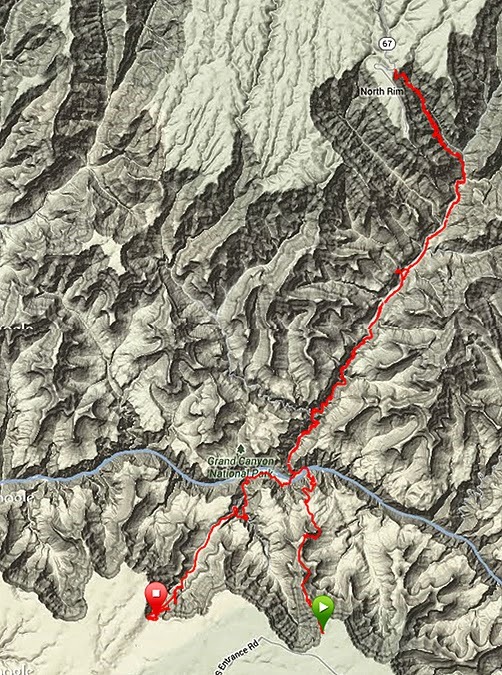 2009, I finished my first round of the White Mountain 48-4,000 footers. 2010, I did my first one day Pemi Loop. 2011, I completed my Winter 48 and hiked all the Adirondack High Peaks (ADK 46-R). Over time I switched from hiking boots to trail runners and mid sized pack to an ultra-light. I kept looking for more challenging hikes on trail, off trail, on old abandoned trails while pushing myself to do more miles over rugged terrain with my camera in hand to document the beauty I was lucky to witness on each adventure. In 2012 I completed my most rewarding hike to date, an under 24 hour Hut to Hut Traverse (Click here for report). In 2013 I got back out to the Knife Edge and Mount Katahdin. - Hiking in the Northeast was incredibly satisfying, however, when I let my mind drift off it would always go back to the Grand Canyon. The memories were faded but I still dreamed about getting back there someday, someway, somehow. Finally, last December I told my parents that in 2014 I would be heading to the Grand Canyon in May or October to attempt the rim to rim to rim hike.When May came around I decided it was now or never so I started off on a solo cross country drive visiting friends and family to and from Arizona on a trip of a lifetime! - I had a decent night of rest just south of the canyon entrance in Tusayan, almost five hours which is a lot for me before a big hike. I got some good advice from transplanted New Englander and White Mountain enthusiast, Max, to park my car at the picnic area across from Yaki Point Road where I was within a few minutes walk of the South Kaibab Trailhead. Later in the day Max would meet up with me for the home stretch and give me a ride back to the Jeep. At the trailhead I checked all my gear one last time, and overheard a dad sending his son off on a Rim to Rim hike. I thought that was pretty cool, reminded me of my dad shaking my hand at Appalachia when he'd spot me for my Presidential Range Traverses. - I hit the trail just before 5 a.m., the weather was nice and cool, mid 40's, and warmed up fast, mid 50's by O'Neil Butte. I was shocked about how many hikers were on the trail, I must have passed two dozen in the first three miles. They were happy to let me jog by, most knew of what I was up to (a R2R or the R2R2R), and would give me words of encouragement. 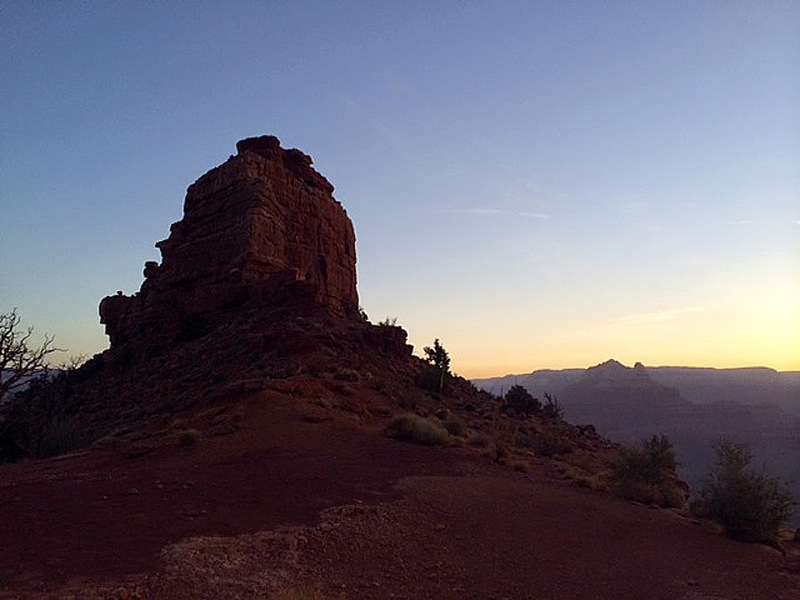 - The sun slowly came up as I descended Cedar ridge to Skeleton Point. I was jogging at a pretty good clip and kept hydrating every five minutes. Every half hour I would either eat my gummies or have a gel/gu. I felt pretty good on the seven mile descent and made it to Phantom Ranch in about an hour and fifteen minutes. The hikers who stayed at the ranch were milling around outside as I restocked my water, put my Gatorade powder in my squirt bottle, took off my shoes to let my feet breathe for a minute, and ate some more gummies. I took about a ten to fifteen minute break before heading off to the north rim. 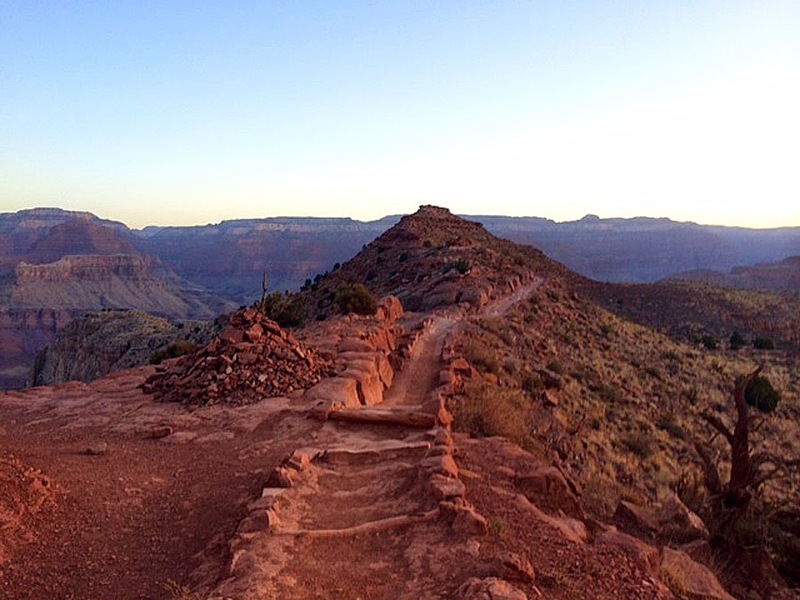 - From Phantom Ranch to the north rim is 14.2 miles over the North Kaibab Trail. It was unfamiliar territory to me, I had read up on it and heard mixed reviews. Some people said it's ok, just a lot of miles. Others said it becomes supper steep with huge drop offs. - The first seven miles to Cottonwood Camp is really flat, it's a pretty cool hike, the trail goes through what is referred to as 'The Box,' where steep walls rise high above you, this is a couple miles long and traps in the heat, one of the hottest areas in the grand canyon. After The Box the trail opens up as it passes by a side trail to Ribbon Falls and up to the campground. The views start to become phenomenal, I really can't explain it, but hopefully the pictures do it some justice. simply put, it's otherworldly! - Every so often I would run into some enthusiastic early morning hikers, once again most knew what I was up to with how fast I was walking. I ran into a couple who told me about three guys ahead of me doing the same hike, they started at midnight and said to "Go catch em!" I also ran into a guy in his twenties just sitting on a rock off trail, he got separated from his buddy and said if I see a guy with poles to tell him that his buddy got lost and headed back. Unfortunately, I couldn't find his buddy because there were about five dozen people fitting that description! - At Cottonwood Campground I filled up on water and started the seven mile 5,500 or so foot ascent up to the north rim. I was happy to finally be climbing even as the sun was out in full force and the temperature was in the 80's. I made sure to apply the sunblock every half hour or so, kept hydrating and eating my gel's/gu's/gummies (the 3G's). On a hike/run like this I can't eat any real foods (the yummy ones) because they don't sit to well in my stomach for the fast pace. - Less than a mile and a half past the campground is the 'Pumping Station' where you can refill on water, I passed on filling up since I had a bunch. From here until Supai Tunnel I motored up at a good hiking clip, while passing probably a hundred hikers! They were all going to different spots, Some rim to rim hikers, others were just going down to Roaring Springs to check out the waterfall, backpackers were headed to Cottonwood Camp or Bright Angel Campground, and the really happy ones were going to Phantom Ranch for a cold beer, yummy dinner, and a comfy bunk bed! - The trail past Roaring Springs to the Supai Tunnel is pretty freaking cool, some parts of the trail have been blasted right out of the steep canyon walls with some pretty big drop-offs, yet the trail is wide enough so you don't feel freaked out, plus the trail it never gets too steep and the footing is great. - I filled up my water one last time just past Supai Tunnel and hiked up the home stretch to the north rim. The terrain changed once again in the final mile, it was old pine, I was quite surprised and pretty happy to get some shade from time to time during the final few tenths of a mile. 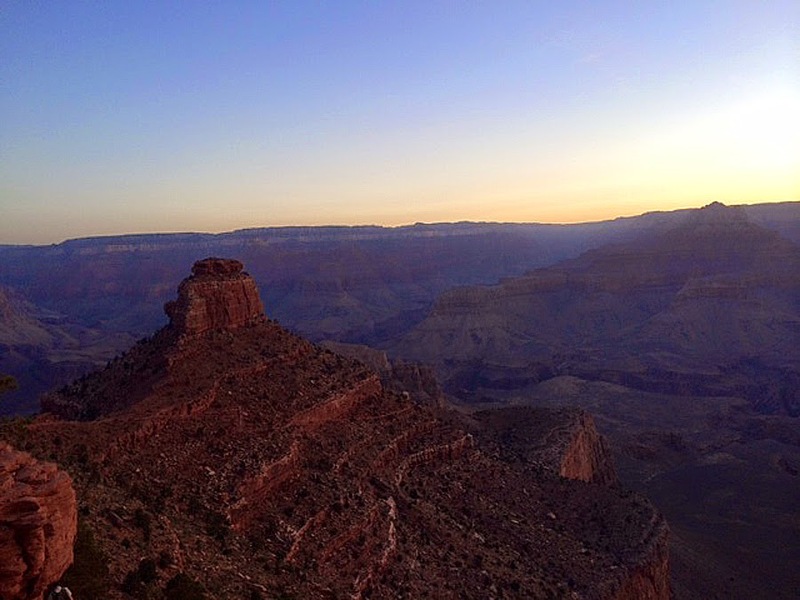 - I reached the north rim at 10:45 a.m., Five hours and forty five minutes after leaving the south rim. I didn't waste much time at the north rim, I did the usual, filled up on water, ate some more of the 3G's, took off the shoes. There were some R2R hikers just finishing up and celebrating, they were talking about cold beer, lucky s.o.b.'s! Anyway, after about ten minutes I headed back down at a light but steady jog, I would stop anytime I saw people on the trail, I always feel weird running up to people or running them down. But most of them were happy to let me pass and rooted me on. People who I passed earlier started to recognize me and thought I was coo coo bananas, which would be spot on! - I passed the three midnight R2R2R's, they were spread out from each other but were all in good shape. I also passed another solo R2R2R's, he was looking good, too. I passed a park ranger just past the Supai Tunnel who urged me to dip myself in the water at Cottonwood Camp. - The walk, jog, run down to Cottonwood was pretty freakin incredible. The views were directly in front of me and epic in scale. New England has some incredible views, but this is like being in an IMAX theater. - I felt very strong descending even as the heat became more intense. I made sure to keep hydrating and pound the 3G's and kept on moving. I made it to Cottonwood feeling great, even running the last mile to the camp in eight minutes. - At the camp I took a nice ten minute break before heading towards 'The Box', on the way I took the side trail to Ribbon Falls, and boy was I happy I made the side trip. What a beautiful waterfall. It drops out of nowhere onto a huge egg-shaped boulder with moss and algae growing on it. You can even hike behind the waterfall to a side outlook half way up the waterfall. I stood at the bottom of the waterfall and let the mist fall on me which cooled me off as the midday heat hit ninety plus. - From here I made my way back over to the trail, I had my fist and only fall of the day, right into a sandy spot near a stream just before hooking back onto the North Kaibab Trail. - Now it was time to head into 'The Box.' Luckily, it wasn't too hot, it was below one hundred degrees so the temperature was not an issue. However, the wind did start to pick up and that dried my mouth out pretty good so I started to get cotton mouth which I have never had while hiking. To offset this I would drink a little more and leave water in my mouth before swallowing. I also would cool myself off when the trail had access to the creek. - Other than that, the walk back to Phantom Ranch through The Box was much easier than I had imagined. Before hitting Phantom Ranch I ran into a group of older hikers who remembered me from earlier, one in the group told me that when I get back up to the south rim to, "Get my head checked!" I told him it's no use, I'm already certifiably crazy! - I walked down to Bright Angel Campground, ate my Snickers bar, and cooled off in Bright Angel Creek. From here it was nine and a half miles up the familiar Bright Angel Trail. It was hot and windy but I was feeling extremely fresh and knew that unless I got bit by a Rattle snake the R2R2R was in the bag! - There is an eerie feeling walking over the Colorado River on Silver Bridge in the early afternoon. It's like a ghost town on the trail, other than a few trepid hikers there is not a sole in the bottom depths of the canyon. 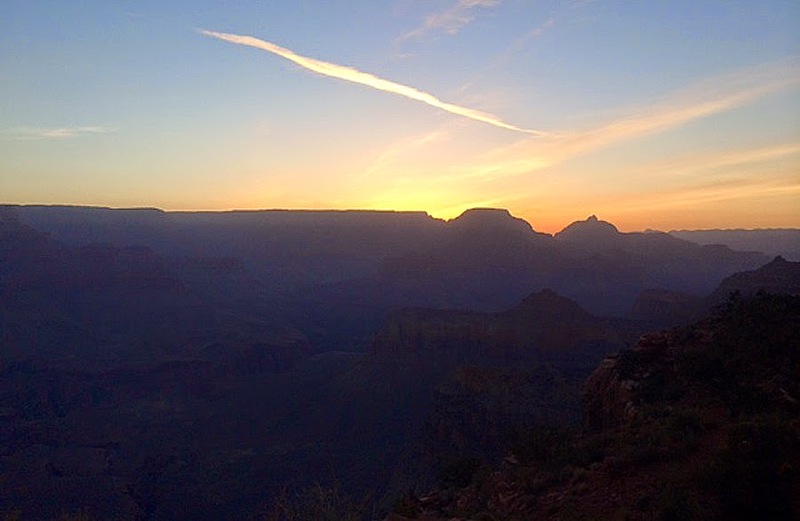 Because of the blazing hot temperatures most people leave the canyon floor early in the morning to avoid any trouble. Also, the Devil's Corkscrew, a series of switchbacks below Plateau Point is not a pleasant place to be for any hiker in extreme heat! - I only saw three other hikers on the way to Indian Gardens (four miles up from Phantom Ranch), one of which was my buddy in the cowboy hat, who got separated from his buddy, remember, the buddy with the poles! He said he was ok, just really tired, hot, and sunburned. He was just about out of water, lucky for both of us he was about five minutes from a water spout at Indian Gardens. Turns out my new buddy, has a buddy who lives in Cranston, Rhode Island! - Within a minute of leaving my new buddy, I ran into the enemy, a rattle snack! He was sunning himself in the middle of the trail. He's the boss so I just scooted off the trail and around as he watched my every move. It was the first rattler I have ever seen! - At Indian Gardens it was more of the same, hydrate + 3G's. Four and a half miles to go, it was around 4:30 p.m., it was windy, temps were in the 80's and from here on out, I was hiking in the shade. In mid afternoon the shade comes rolling over Indian Gardens and above making the final brutal stretch of switchbacks a little less miserable. - I finally started running into a few more hikers again over the final four miles. I also saw some late day trail runners heading down to the river. The canyon runners reminded me of the bad asses that head and do a classic Franconia Ride Loop in two hours after work in the summer months! - I saw two interesting things on the way to the three-mile rest house. First, was a girl puking on the side of the trail, I asked her friend if she needed help but they declined. Then I saw two girls peeing on the side of the trail. Stay classy, ladies! - Shortly after the three-mile house I ran into Max. Max, was nice enough to meet me on the trail for the home stretch. Max is an Iron Man athlete, having completed IRONMAN Placid, three times! He also has hiked the 4,000 footers in New England, and much like my parents and my brother and I, he took his family on hiking adventures all over New England when they were younger. Max had an abundance of knowledge about the canyon and I picked up a lot of great information from him on where to head to next time I make it back. - We hiked together to the mile and a half rest house and then I took off to the top where I would meet back up with him. Max is recovering from surgery so he had to resist from hiking as fast as he usual does. The final mile and a half went very well, I topped out just before 6:25 p.m., thirteen hours and twenty four minutes after I left the south rim. I felt fine, I never hit a wall, and I really stayed on top of drinking a few sips of water every five minutes and going with the 3G's every half hour. After getting a tourist to snap my picture on the rim and getting out that apple I bought at the ranch I headed back down to meet Max for his final five minutes or so up to the top. - We headed to the Back Country Exchange lot to Max's car and he drove me back to my Jeep. It was great to meet Max and I hope to see him again next time I'm out in Arizona or if he gets back home to the Whites! - Back at the car I got out of my shoes and relaxed before heading back to the hotel. I called my parents as soon as I got a good cell signal to tell them I was alive and well. I can't thank them enough for all the support they have given me over the years as I pursue my passion of hiking and taking pictures. I really am lucky! - As for the Rim to Rim to Rim hike/run, it was the hike of my dreams! The views are to die for and around every corner there is something else to look and shake your head with astonishment at. If you do run the R2R2R at a fast pace, make sure you try and hike a day before or after to just waddle around the trail and stare at the canyon walls, have a beer at Phantom Ranch, dodge the mule trains, stand in the middle of the Black and Silver Bridge over the Colorado River, take a nap at Ribbon Falls, etc.! - This was my last hike of my road trip, it was a fitting ending. I hiked three days in the canyon, and one day up to Arizona's highest peak, Humphreys Peak. It was a trip I will never forget and can't wait to get back out there and explore more off the beaten path trails deep within the Grand Canyon walls. This section of the trail has been blasted out of the side of a canyon wall! Max pointed this out to me off the trail, pretty cool! It's like walking a treadmill ramp! 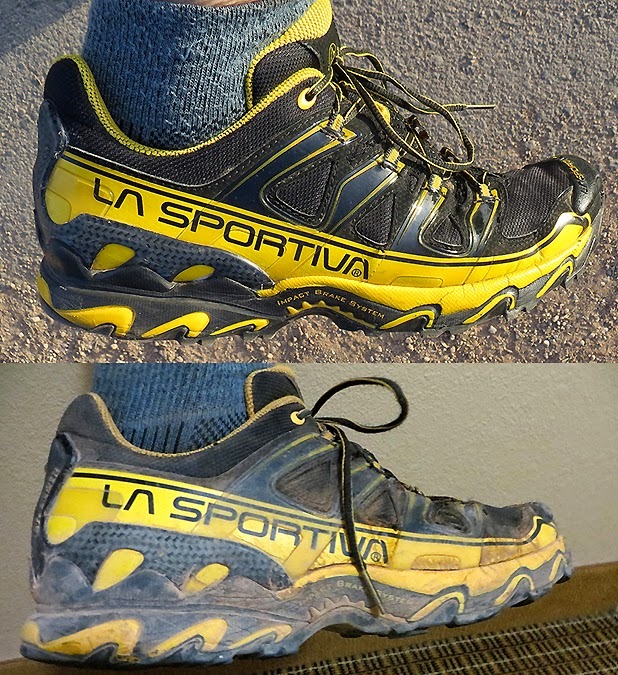 before and after shot of my trail runners, not too bad! Simply amazing photos. Job well done, you are an incredible athlete! Thanks anonymous, glad you liked the pictures! Hi Chris - These photos are amazing. I'm pretty passionate about the Whites and often think I wouldn't really want to explore other terrain the way I do with the Whites. You're last two posts and pictures have really changed that for me. You really captured some amazing scenes and views. A couple that were my favorite: 1) the trail sign labeled one mile past Phantom Ranch - I love signs in the Whites as they have their own weathered signature to them. I feel this sign shows the same type of uniqueness for that climate. 2) Leaving Indian Gardens with the walls looking like a "V" in the distance - very cool. I also really like the old telephone poles. They remind me of The Good, The Bad and The Ugly, when they're riding through desert like terrain, there are telephone poles like this. Thanks for a great report! Around every corner there seems to be something else that catches the eye and needs to be photographed. It really is a magical place and I hope you get out there, the views are some of the best in the United States. It's a lot like Mount Washington in the sense that there are trails that are lightly used, there are trails that are swarming with people, and people who need bailing out by SAR!